A basic must-have that everyone needs in their wardrobe is an infinity scarf. I’ve fallen in love with infinity scarves, so much so that normal scarves have become a thing of the past. They are so easy to just throw on and the placement always looks great. To show you guys how versatile this cozy accessory is, here are three ways to style it. 1. Keep it causal! This look will work for anyone and everyone. It’s the easiest way to work an infinity scarf into your wardrobe. The first way I styled this gorgeous cranberry infinity scarf with a soft tunic sweater. 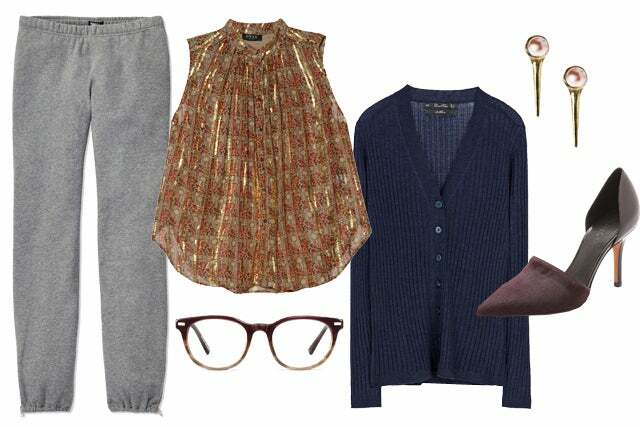 This is a perfect outfit for running errands and holiday shopping! I simply threw on a pair of fleece leggings and tall boots to complete the look. 2. Next, I went with a little dressier look. Dress up your scarf with something shiny or sparkly. I paired the same scarf with super fun gold harem pants and a simple grey top. I finished off my look with a leopard-print clutch. 3. Infinity scarves even work with edgier outfits. I couldn’t resist throwing in a little leather. It’s a great way to mix up the textures of your ensemble. I threw on my staple leather jacket over a tight striped midi dress and finished off the look with a pop-color bag. If you’re going to try one trend this season, make it leather (or faux leather) pants! They’re super hot right now and a great way to break from your everyday denim. I love the edginess they bring to feminine pieces and even some of the most basic neutrals. On top of being chic, they can be extremely comfortable. You know the saying, “Style over comfort?” Well, that’s not the case with leather pants! Leather pants are most likely my favorite alternative to jeans. They fit the body nice and snug, keep you warm, and add a wow factor to your outfit. Initially, I thought there were limited ways to style leather pants, but after living in my leggings, I realized they’re a lot more versatile than I thought. Try going casual cool in black and white, pair them with a classic cable knit, or add a menswear vibe with a plaid buttondown. However you decide to style your pants, I promise you’ll not only look chic, you’ll feel chic too! It’s T-minus eight days until the Isabel Marant collection hits select H&M stores worldwide, and the retailer has just launched a dedicated microsite in anticipation. It features plenty of photos of the line, a countdown clock and video—all arranged in a Tumblr-like format. According to the site, the H&M locations carrying the collection will open at 8am local time on November 14 and the online shop will begin offering the collab at 12pm EST. In the “how to shop” section, H&M explains that they will again be utilizing a wristband system to organize shoppers day-of. The first 300 people in line will be broken down into groups of thirty and each will receive a colored wristband that corresponds to their group. Each group will have 15 minutes to shop the collaboration, and there will be five minute breaks between groups while staff, presumable, straightens out and restocks. After three and a half hours, the collaboration will be opened up to everyone. H&M will be enforcing a purchase limit to try to curb resellers. 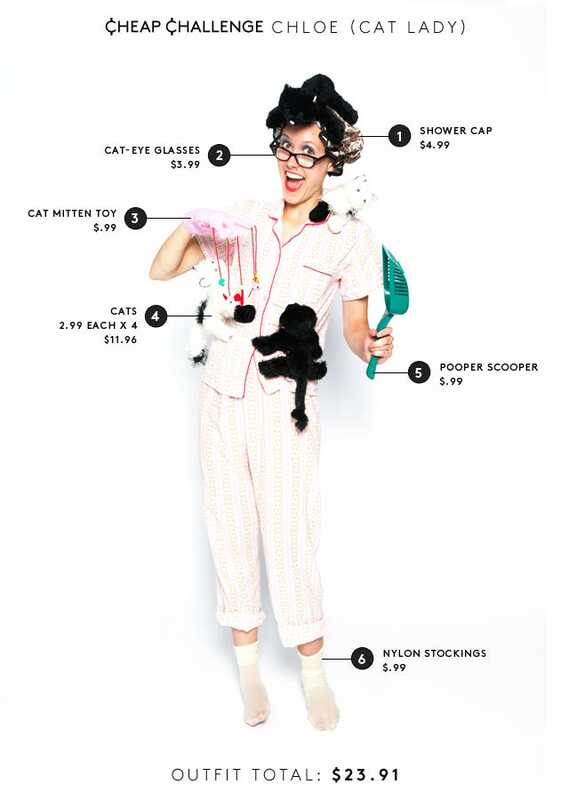 Each shopper can purchase one item per style. Returns will be accepted for three days after the collection’s release. Whether it’s key pieces of jewelry or the wardrobe essentials everyone needs, we’re big proponents of investing in timeless fashion staples. The same goes for beauty, too, so here are the nail polishes every woman should have in her repertoire! Yes, you can pile on every product under the sun, day in and day out. Or, try to be totally Zen to zap the stress, all in an effort to make your complexion truly gorgeous. But, the truth is, when it comes to skin — along with how you feel, too — you truly are what you eat. What to eat: Salmon (preferably wild instead of farmed), flax seeds, walnuts and olive oil, as well as raspberries and chia seeds. What to eat: Pomegranates, goji berries, tomatoes, and broccoli. Why: “In addition to applying sunscreen, I also recommend eating your sunscreen,” says Murad. “To boost the efficacy of topical sunscreen, eat fruits that contain nutrients that can protect you from the inside out.” Pomegranates are a great source of pomphenol (as well as the aforementioned ellagic acid), a potent antioxidant that has been shown to increase the power of SPF by helping to decrease the amount of free-radical damage in the body. What to eat: Foods that are packed with vitamin C (like kale and berries), as well as eggs, beans, seeds, goji berries, and avocados. Why: “Kale, as well as most berries (like blackberries, blueberries, raspberries, cranberries and strawberries), have tons of vitamin A, C, and calcium which are all good for skin. But, it’s specifically their high content of vitamin C, a powerful antioxidant, that makes it an especially good food for fighting premature aging due to UV damage,” explains Lynch. Peeling Nails: I’ve got a ton of experience with this nasty nuisance. Wearing gloves while doing household chores, like washing dishes or deep cleansing in the bathroom, and being a devoted moisturizer morning, noon, and night, work wonders. But BH says that it can also be a lack of nutrition: “ This could be a result of a poor diet, or of painting your nails so much that they don’t have time to breathe. Up the amount of calcium you’re eating, use a nail strengthening polish and give your nails a few days off in between manicures (when you can).” Favoring five-free polishes over more toxic formulas seems to keep my nails much healthier too. Ridges: “If you’ve got ridges in your nails, apply a ridge filler as a base coat to even things out and give the polish a good foundation,” BH recommends. Also, a quality three-way nail buffer can file down annoying ridges and give un-lacquered nails a clean, glossy look, if you’re trying to give nails time to breathe as suggested above. But be weary of over-buffing and thinning out nails instead of nursing them back to health. YOU know you want to. Now if you dare, is how you can. 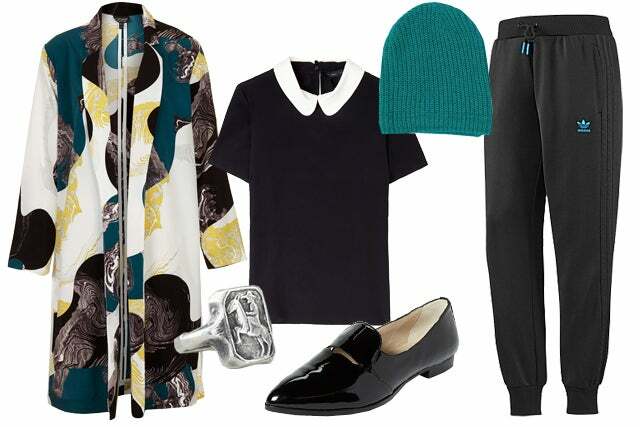 Adidas Girly Track Pants, $60, available at Adidas; Marc by Marc Jacobs Monochrome Alex Silk Peter Pan Collar Blouse, $268.13, available at My-Wardrobe; American Apparel Fisherman Beanie, $22, available at American Apparel; Topshop Marble Print Side Split Coat, $160, available at Topshop; Elizabeth and James Aly Loafer, $298, available at Nordstrom; Bailey Hunter Robinson Man On A Horse Ring, $80, available at Steven Alan. TNA Sandwell Pant, $60, available at Aritzia; Otte NY Print Peggy Top, $265, available at Otte NY; Zara Ribbed Cardigan, $79.90, available at Zara; Aesa Short Pearl with Thorn Earrings, $308, available at Aesa; Warby Parker Sinclair, $95, available at Warby Parker; Vince Claire Haircalf d’Orsay Pumps, $395, available at Shopbop. 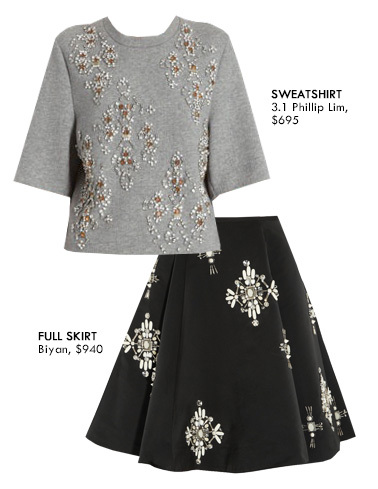 Ease into the sequin-filled holiday season with fall’s unfussy jewel-embellished pieces. Eating right can help make your hair shine. And luckily, lots of the picks that are good for your body’s health are good choices for your hair. Read on to find the best — and tastiest! — hair care tips. Salmon. Fish is full of protein, which is the chief component of hair. Oily fish like salmon contains beneficial omega-3 fatty acids that can help prevent a dry scalp, as well as vitamin B-12 and iron. Beef, lamb, and oysters. These foods can supply your body with zinc, which can give your hair a boost. Chicken and turkey. Poultry is packed with protein; it’s also rich in iron. Eggs. Eggs are another food that’s rich in protein; they’re also a good source of vitamin B-12 and biotin. Milk, yogurt, and cheese. Dairy products are plentiful sources of calcium and protein. Choose low-fat or fat-free versions so your waistline and hair can both benefit. Nuts. Cashews, pecans, and almonds are full of zinc. Walnuts contain zinc too, along with alpha-linolenic acid. And Brazil nuts provide the mineral selenium, which can help keep your scalp healthy. Many nuts contain B vitamins as well. Flaxseed. Add ground flaxseed to cereal to boost your consumption of beneficial omega-3s. Sunflower seeds. Choose these for a snack — it has benefits for your hair because of its B vitamin content. Olive oil. This healthy oil contains beneficial vitamin E, so use it for your sautés as well as your salads. Lentils and kidney beans. Legumes like these supply the protein your hair needs for growth; in addition, they provide iron, zinc, and the B vitamin biotin. Whole grains. Whole grains are full of B vitamins, iron, and zinc. The foods to choose are whole-grain breads, breakfast cereals, and pasta. Other good whole-grain sources are oatmeal, brown or wild rice, buckwheat, and popcorn (skip the butter, though). Avocado. Eat avocado to get a good dose of vitamin E — pass the guacamole! Broccoli, spinach, and chard. Dark green leafy veggies are full of vitamins A and C. Your body uses these foods to produce sebum, the oily secretion on your scalp that works like conditioner. These veggies also pack iron and calcium. Carrots, squash, and sweet potatoes. The vitamin A in orange vegetables can help keep your scalp healthy. Apricots are a good choice, too. Cauliflower and cabbage. These vegetables provide silica, a mineral that may help protect your hair against loss and breakage. Onion and garlic. Your hair will benefit from the bioflavonoids contained in these flavorful allium vegetables. Oranges and grapefruit. All the citrus fruits, in fact, are good sources of vitamin C, which helps your body absorb iron. Water. Drink plenty of water to keep your hair — and your body — well hydrated. A balanced diet that’s heavy on fruits, vegetables, whole grains, and low-fat dairy foods is a great choice for the health of both your body and your hair. Choose a mix of the foods on this list to ensure a healthy head of hair. If you’re considering taking supplements to make sure you’re getting enough of any of these vitamins or minerals, talk to your doctor. Some can be dangerous in high doses. Choose the right foods, such as the ones listed here, and you’ll have beautiful hair to complement your healthy physique.